This cargo bike loomed out York's fog yesterday. Presumably it's just locked up while the eco-gardener owner is on the job, rather than standing around as an ad, or serving as a planter. I wrote a recent article for the CTC magazine on how cargo bikes are thriving in London, where they deliver faster, more flexibly and cheaper than cars. 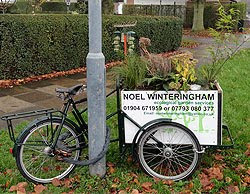 I've also featured cargo bikes on this blog related to my interests, such as beer and cake. And a cargo bike is just what I need, to let me cycle through York's 'pedestrianised' city centre. Because, contrarily, it excludes bikes, but seems to allow plenty of motor traffic for 'deliveries'. So, with a cargo bike, I can happily cycle through those winding medieval lanes to buy a plug from Barnitt's, on the pretext that I'm 'delivering'. Well, a lot of the cars seem to be pulling the same trick. Hi and welcome to York. Delivery hours in the Footstreets are restricted to mornings and afternoons. Over the summer Labour were talking of changing the current morning end time of 11 am to 10:30 am.